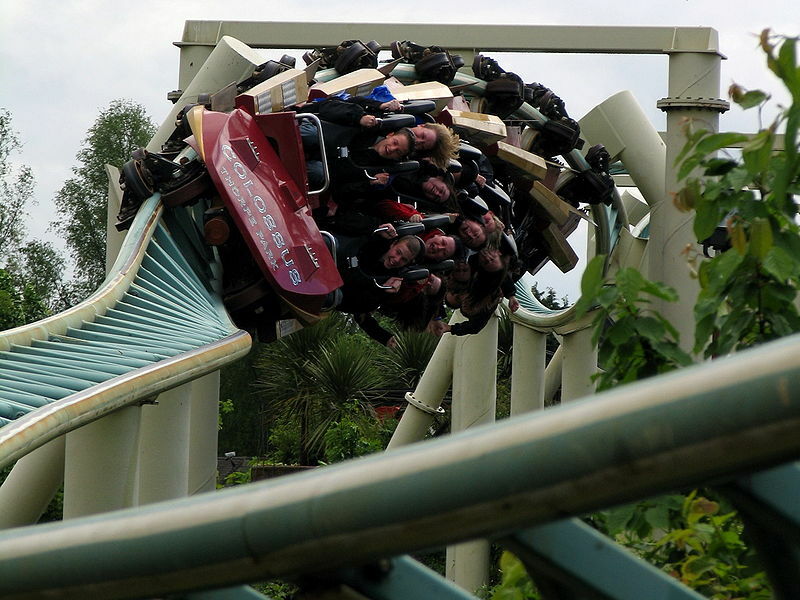 Many people love the fun and excitement of roller coasters and thrill rides. As they hurtle around the track or spin through the air they are probably oblivious to all of the day to day problems and technical issues that must be overcome to keep the rides running. I worked at a major theme park for several years and my job for the most part was to run the rides. I spent my days in charge of some of Europe’s best known thrill rides and had to deal with all sort of issues on a daily basis and one of them, surprisingly, was trees! The most annoying thing about trees is their propensity to grow! They also have an irritating habit of moving and losing branches in bad weather and shedding leaves all over the place in the autumn. In short trees are living things and are constantly changing. This fact presents a persistent worry when operating a thrill ride as a tree which is comfortably clear of the ride area one day can be hanging in the path of the ride the next. Trees and bushes can also move during the day and present a hazard to riders. One of the safety routines on roller coasters and thrill rides is to run a foliage check in the morning before the park opens. Not all areas of the track are visible from outside of a roller coaster and even with flat rides it is not always possible to see from the ground if a tree is too close to the ride. The only solution is to send some unfortunate members of staff for a ride to check everything. The people concerned have to ride the entire circuit with their arms outstretched to make sure nothing can hit a guest. If there is a problem, the staff will get hit by the tree, its location is identified and the offending branch cut off. Amongst the many tools that ride engineers have at their disposal is an array of tree surgery equipment and it gets used more often than you would think. Because of bad weather, especially high winds, trees and bushes which have been checked in the morning can still present a problem later in the day. I was once running a very well-known roller coaster when a guest disembarked after their ride and immediately came over to tell me that they had been hit but some foliage but had got disorientated on the ride and could not remember where it was. I shut down the ride in order to run a check and in the absence of another volunteer I handed the controls to a colleague and took the ride myself. Half way round the circuit my hand was struck by a branch and I returned to the station with blood running down my arm. Several of the guests on the platform saw this and left. I can’t imagine why! Naturally I got the tree branch cut down and all was well for the rest of the day. Roller coasters usually have cameras positioned around the ride to enable the operator to see areas of the ride and queue line which present safety issues. Silly people sometimes jump into the ride area and close to the tracks to retrieve lost items and if this happens the ride must be stopped immediately to avoid the train hitting the guest. On one occasion I was operating the same coaster on which I had experienced a cut hand when there was a sudden heavy shower of rain. A few minutes later I looked at one of my VDU’s to check the ride area to be greeted by a picture of some leaves! A branch had dropped under the weight of the rain directly in front of the camera lens and I could no longer see a section or the ride. Another stoppage ensued whilst some pruning was performed. Trees and bushes are two of the many things which theme park guests probably never think about but which are a constant concern for the staff. The structure of the rides and the ride vehicles are largely predictably and tightly controlled by safety systems but natural hazards are quite another matter. This entry was posted in Stories and tagged roller coasters, safety, theme park rides, theme parks on May 22, 2013 by Sally.